"This is a great summer or special occasion fruit salad. I don't like the marshmallows or cream in fruit salad so this one rocks for me and reminds me of my momma. Sprinkle a little sugar on top if desired." 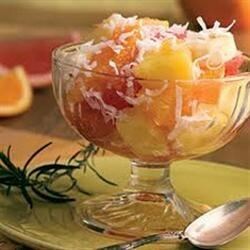 Toss oranges, apple, crushed pineapple, coconut, and cherries together in a bowl; refrigerate 30 minutes before serving. See how to make a quick-and-easy ambrosia salad.